The 1/4 in. x 1/4 in. x 3/8 in. Compression Shark Bite Push-Fit Tee allows you to create a dual stop out of your existing stop valve. Simply thread the compression end of the tee onto your stop valve and you now have 2 Push-to-Connect outlets that will work with 1/4 in. PEX Pipe and Shark Bite Fittings. 1/4 in. size is common in appliance applications and is used to run lines to faucets, toilets, dishwashers, ice makers, and other small diameter applications. 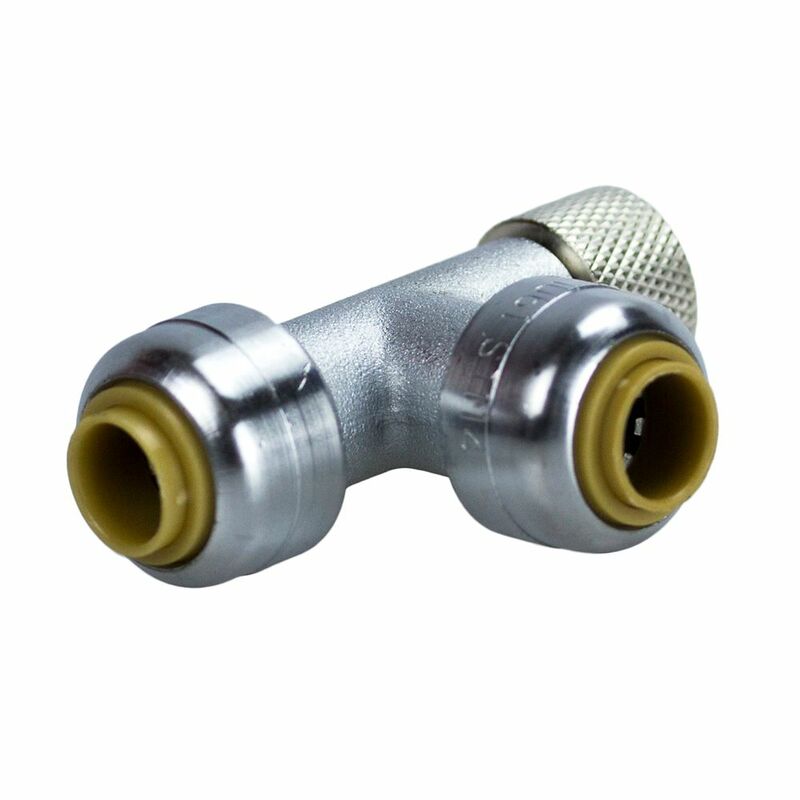 Shark Bite fittings are the easiest way to join copper, CPVC or PEX pipe in any combination with no soldering, clamps, unions or glue. Just insert the pipe and the stainless steel teeth bite down and grip tight, while a specially formulated O-ring compresses to create a perfect seal. Disassembly is just as fast using the simple disconnect tool so fittings and valves can be easily changed and reused. They can even be rotated after assembly for easier installation in tight spaces. For warranty information on this product, please call our Internet Customer Service Center at 1-888-820-0120. Push on connection, no special tools required. Works on Copper, Pex and CPVC pipe. Nailing flange to help ensure hydrant drains properly. Angle configuration for easy hose attachment. Sb Tee Stop Vlv 1/4 Inch X1/4 Inch X3/8 Inch Comp Rt Lf The 1/4 in. x 1/4 in. x 3/8 in. Compression Shark Bite Push-Fit Tee allows you to create a dual stop out of your existing stop valve. Simply thread the compression end of the tee onto your stop valve and you now have 2 Push-to-Connect outlets that will work with 1/4 in. PEX Pipe and Shark Bite Fittings. 1/4 in. size is common in appliance applications and is used to run lines to faucets, toilets, dishwashers, ice makers, and other small diameter applications. Shark Bite fittings are the easiest way to join copper, CPVC or PEX pipe in any combination with no soldering, clamps, unions or glue. Just insert the pipe and the stainless steel teeth bite down and grip tight, while a specially formulated O-ring compresses to create a perfect seal. Disassembly is just as fast using the simple disconnect tool so fittings and valves can be easily changed and reused. They can even be rotated after assembly for easier installation in tight spaces.